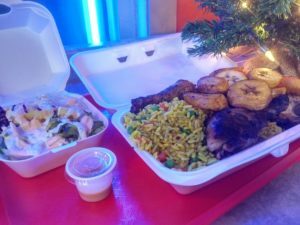 Located on the corner of Bronson and Gladstone, I had been awaiting the opening of Africa Slow Food after seeing signs about their charcoal-grilled chicken, and African and Caribbean food. Making the walk up the street on a cold winter evening, it was only upon entering that I realized how small the space was, with just a four-person counter along the window. With two other people waiting on their food, there was just enough space to keep things from being awkward. The menu is written on a chalkboard on the wall, though there are take-out menus as well. There are familiar dishes like the grilled chicken (combos, half and whole birds), plantains and kebabs, as well as some cool stuff that requires some Googling for the uninitiated like me. Egusi (ground squash seeds) soup, pondu (crushed cassava leaves), and ndolé (a stew of bitter greens and nuts) all piqued my culinary curiosity. However, the smell of the chicken was too much to resist, so I went with one of the combos of chicken, fried rice, plantain and salad ($15). Drinks are serve-yourself from the cooler next to the cash register. Settling in at the counter, and trying to minimize my eavesdropping on my counter-mates’ conversation (but not really), my food was soon brought out. Despite eating in, it was still all in Styrofoam containers, which is a bit disappointing from an environmental standpoint. 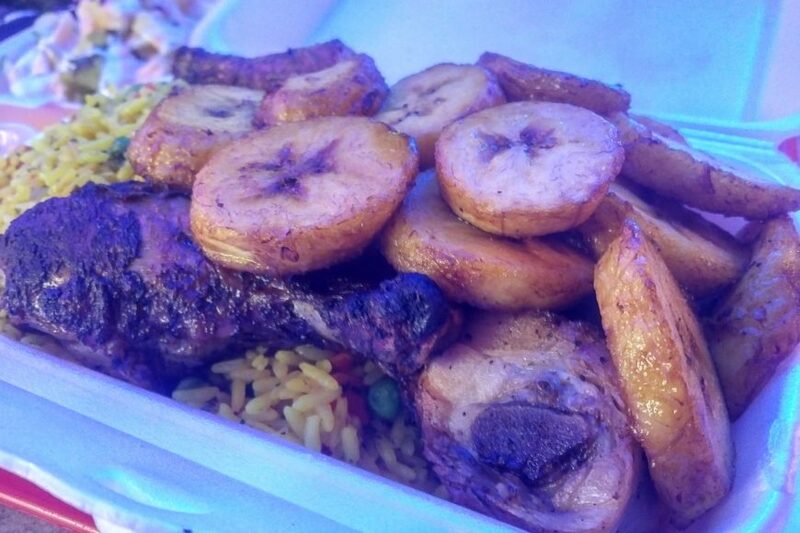 My container of chicken, rice and plantains was full to the brim with nicely charred chicken, yellow rice and lightly browned plantains. I enjoyed the light curry flavour of the rice, which was cooked properly with no clumpy, starchy blobs. The portion of chicken was quite good, with a couple drumsticks and a thigh. The seasoning was fairly mild, but the char from the grill lent all the flavour that was needed. It was a shade over-cooked, but these cuts of meat were pretty forgiving. A little cup of hot sauce was provided on the side; when you get a tiny little half-ounce cup, and it’s not even half full, you know it’s gonna be hot. And hot it was, with some nice fruity overtones, but man, still really hot. After I had received my food, I had put in another order of the same to take home to my wife for when she got home, and she would later agree with me that the plantains were fantastic. They had the perfect texture for cooked plantains, with just the right amount of sweetness and an earthy seasoning. I wasn’t sure what to expect with the salad but ended up enjoying what I got. It was effectively a house-made coleslaw with red and green cabbage, julienned cucumber, pickles and pineapple, and a generous dousing of creamy dressing. I’m not normally very big on pineapple (keep it off my pizzas, you blasphemers!) but the punch of flavour and sweetness really worked in this salad. Africa Slow Food is knocking it out of the park with their chicken and plantains, so now that I’ve had their entry-level food, I’ll have to be more adventurous on my next visit. PS. The whole chickens are $15, and we’ve gotten them a couple of times since. They’re definitely worth the extra few bucks over the greasy rotisserie chickens in grocery stores. Call ahead and get that charcoal-grilled goodness.